To cook the meat, heat a large Dutch oven or deep frying pan over medium-high heat. Then season the meat on all sides with salt. Add the oil to the pan and brown the meat. While the meat is browning, peel and roughly chop the onions, carrots and celery. When the meat has browned on both sides, transfer to a plate and set aside. Add the onions, carrots and celery. Sprinkle with a bit of salt and brown. Once golden, add the seared beef back to the pan. Cover the ingredients with water or just enough to cover the meat. Bring the mixture to a simmer. Lower the heat, cover and cook for about 3 to 5 hours or until the meat are fork tender. To prepare the other ingredients, first remove the fat from the surface of the beef stock and bring to a gentle simmer. Next, toast the peanuts in a large pan, stirring occasionally until light golden brown. Allow the nuts to cool down and process them in a food processor until finely ground. Transfer to a bowl. Next, grind the raw rice in a spice grinder and toast the in a pan until lightly golden brown. Transfer to a bowl with the ground nuts. Add enough of the hot stock to form a paste and set aside. To cook the Kare Kare, heat oil in a large heavy bottomed pan and sweat the onions, followed by the salt. Cook until the onions are soft. Add 5 cups of the simmering stock and peanut mixture, stirring with a whisk until combined. Then add the beef and let it simmer for 15 minutes until tender. Stir the mixture occasionally. Next, add the eggplant, string beans, banana heart and cook until the vegetables are tender. Add more water if the mixture is too thick. Add the calamansi juice, then season with salt to taste. Allow to simmer for another 2 minutes and take it off the heat. Out of all Asian cuisines, I have to confess that I am most ignorant when it comes to Filipino cuisine. First of all, I have yet traveled to the Philippines to sample its local cuisine; secondly, it’s not easy to find Filipino food, as outlined by Marvin of Burnt Lumpia and this article in Los Angeles Times. Divina Pe of Sense & Serendipity is here today to share with us a Filipino kare kare or ox tail and peanut stew recipe. Divina is a professional cook, holistic nutritionist and aspiring cookbook author from the Philippines and you can expect many delicious recipes and mouthwatering food photography at Sense & Serendipity. Please welcome Sense & Serendipity to Rasa Malaysia and learn all about kare kare, a delicious Filipino stew. I grew up with my late-father’s Chinese cooking and actually regretted not spending more time in the kitchen with him. He never encouraged me to cook but his love for food was contagious enough for me to do the same thing. When Rasa Malaysia invited me to do a Filipino dish on her blog, I am really honored and yet surprised at the same time. I do eat Filipino food but rarely cook them at home except for the classic adobo. I was filled with tension not knowing what to make. Of course, the restlessness shows when one of the authorities in Asian cuisine invited you for a guest recipe. And one of the recipes that came to my attention is Kare Kare. There are a several stories about the origin of Kare Kare. First, it says the dish came from Pampanga, which is considered as the culinary center of the Philippines. Others believe that it is a noble dish served to Moro elite who once settled in Manila before the arrival of the Spaniards. I’ve learned how to make Kare Kare when the amusing and talented Chef Stephane Meyer asked me to cook Filipino food for staff meal. He was aware that I only have two months left in Vancouver before going back to the Philippines. So, I asked again if he really wants Filipino food hoping that he would ask for something else. And of course he is while giving me that odd look. After my morning shift, I went straight to the library to search for Filipino cookbooks and specifically look for Kare Kare. I know how to cook adobo but I still chose Kare Kare, not knowing that might get offended by the foul-smelling fermented shrimp paste. I even emailed my brother and sister to send me the recipe so I could compare the ingredients and the procedure. I also visited the Filipino store to buy some ethnic ingredients while giving the other market list to the chef requesting for beef short ribs, some vegetables and a green papaya. The chef and 2 other colleagues (not sure about the 2 owners) loved it. I served the Kare Kare with some green papaya salad and steamed rice. After that he requested for another dish. Kare Kare is a dish that seem complicated to do. But if you compare this with other stews, it’s not too difficult at all. I always cook the meat one day ahead, store in the fridge and remove the hardened fat on the surface the following day. There are three components of this dish. First is the meat, which is usually ox tail but it can also be done with other cuts of beef such as beef shanks or short ribs, or a combination of both. Sometimes tripe is also added. Second is the sauce which is made of sliced onions, finely ground peanuts, toasted ground rice and the annatto seeds (mainly for color). The last component is the vegetables which include banana flower bud or heart, eggplant, string beans, okra or bok choy. This is a dish that you could either hate or love because of its naturally bland flavor and the type of peanuts or even peanut butter that you use would make a huge difference. And Kare Kare should be served with bagoong, a pungent and salty condiment of fermented shrimps. Without it, you might as well cook something else. While beef is the most common ingredient, Kare Kare can also be made with seafood (prawns, squid, and mussels) or all vegetables. Yet another hit recipe and great article. I love anything oxtail seriously,i’d love to give this a try one day, i’ve yet to cook a Filipino dish. THanks for sharing! In Malaysia, we have ox tail soup. I love ox tail soup but this definitely looks different even though ox tail is used. Thanks for introducing us to this new dish. Another great post on Filipino food! Thanks Bee, for introducing everyone to more and more filipino dishes and to more filipino bloggers. Divina, great looking kare kare. It’s one of my favorites, yet I’ve never tried to make it myself. You’ve inspired me! Mmmm this looks delicious. I love ox tail, it makes such wonderful stews. Thanks for sharing. 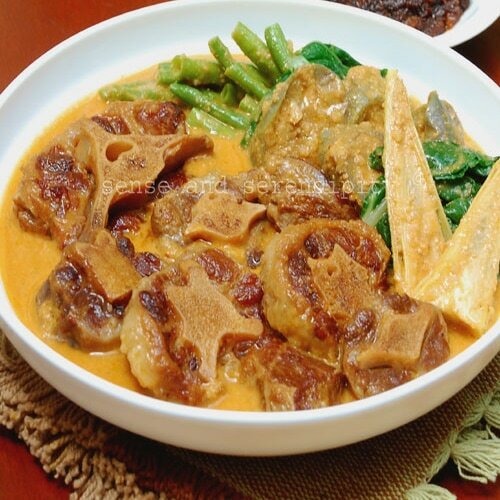 Kare Kare is one of Filipino’s most loved dish, thanks to Rasa Malaysia for introducing another Filipino recipes. To the author good choice, I myself have not cooked Kare Kare from scratch for ages, great post thank you. This is a lovely stew! Given such a detailed recipe and interesting information, I bet we may easily get through the steps. Bee, Divina, thanks for sharing. Thanks every one for your comments. Traditionally, ox tails are just boiled until tender and cook with the rest of the ingredients. But I love to sear it to add more flavor to the meat. I’m sure there are other versions of this dish. I think this dish is adding more or less of the ground peanuts according to taste and adding more or less water for desired consistency, and salt to bring the whole dish together. Some prefer a chunkier sauce, while other wants it really smooth. Thank you very much Bee for the invitation. I’m writing a pork adobo in pineapple vinegar recipe and I’d like to link to 80 breakfast’s adobo guest post when I saw this recipe in the first page. Divina, your pictures are gorgeous. I couldn’t agree with Bee more. They’re mouthwatering photos. I love oxtail stew very much. But cooking the oxtail with peanuts is quite new to me. Actually, I haven’t had any chance of trying this classic Filipino cuisine. I can tell it must be very delicious from your pictures and recipe. Great sharing of both of you. Love this stew, looks so delicious! Glad to see you here, I love both your blogs so much! it looks so delicious, but it seems so complicated to make. the only filipino food that i have made so far is lumpia and it was amazing. hopefully i can make this one too. Beautiful dish, Divina never fail to impress me with her delicious food and stunning pictures. Beautiful post and beautiful recipe from 2 beautiful food bloggers! Kare-kare is something i cook only on rare occasions because, yeah it’s way too complicated… but Divina’s writing a detailed recipe and the tidbits of info make me look at Kare-kare differently. This is a great post… awesome pictures too! Good job Divina, you’ve done it again! Thanks for guesting Divina! You ladies rock! I have to admit that I have never tried Filipino food (which considering the proximity of where I live to Philipines is a shame!). I wouldn’t mind to give a try to this dish with shrimps or seafood as Divina suggested. Great idea to invite Divina to do a guest post. I love Divina. Fantastic choice. Have bookmarked this. I will try it this winter. Thanks Bee for getting her to do this guest post. She is awesome. Kare-kare is one of my favorite stews and I congratulate Divina and the editor for sharing this unique and hearty Filipino dish to the world. This is a wonderful site! You’ve done an interesting twist to a traditional festive dish. Yes, the oxtail is usually just boiled. Further, Pinoys prefer it with the skin on. The translucent skin imparts a lot of gelatin into the stew so as to give it that characteristic “sticky-lips-feel” while eating it. LOL. I could never understand why western groceries or meat shops skin oxtail. Further, the rice used for kare-kare is glutinous rice and not jasmine rice. This is to thicken the sauce. I also do not know much about Filipino food. Thanks for sharing. filipino food is a hard sell because they’re not very pretty presentation-wise but the flavors are awesome! Of all Filipino dishes, this is definitely on top of my list! Be it oxtail, beef tripe, shanks, short ribs, chicken and yes…….seafood. My idea of a sumptuous dish is kare-kare laden with asparagus tips, ong-choy, bok-choy and banana hearts, with fresh alamang (shrimp fries) cooked in coconut milk on the side. I like the idea of using the more fragrant jasmine rice instead of the usual glutinous rice. And adding the holy trinity of French cuisine to the broth?…Another layer of flavor?… Why not? This will add more depth to my favorite ulam (dish). But to add or not to add calamansi…well, that is my ?. Like “kotsengkuba”, I find it an odd ingredient in a kare-kare recipe. (BTW, kk, I like your username. It amused me.) Well, to settle this dilemma: The next time I cook (kare)2, I’ll set aside half of the sauce and give calamansi a try. Thanks Ms.Divina for sharing your kare-kare innovation. I’m Filipino and our cuisine is a pastiche of other cultures; Spanish, Chinese, Malaysian, Indonesian and Thai. Although people may argue that this combination would engender a unique palate of flavors, it is on the contrary. There are so many influences that it loses its identity. Filipino cuisine does not have a signature taste like Thai cuisine has, however Kare Kare is one dish that I’m very proud of because of its complexity. The other dishes that I would highly recommend is Pinakbet, which is a vegetable stew with bagoong (shrimp paste), and Palabok, which is a unique noodle dish. How would you know that the Thais, Malaysians and Vietnamese never borrowed anything from our cuisine? Signature dish? Hmmm. Maybe search for Chicken Sinigang with Sampaloc leaves or Rellenong Bangus or how about Dried fish with Coconut Milk and banana hearts. The problem with food is that it’s pretty hard to pinpoint who invented what. The Balut while being the more popular name for the boiled duck embryo here in the US is also prevalent throughout SE Asia and you’d prolly have an argument if you told other Asians that they borrowed the idea from the Philippines. The patis or fish sauce AFAIK was invented in RP by Aling Tentay and it spread throughout Asia including Japan, Thailand, Vietnam etc. but they also call it by different names with slight variations in ingredients. Awesome recipe! I usually use oxtail for making pho. I also love the addition of short ribs. Yum… I’ll give this recipe a try next time I go to the Asian market. Thanks Bee for introducing us to Divina’s lovely blog. A warm welcome and thanks very much for sharing this wonderful recipe. Kotsengkuba – yes, it could be weird for some people. I added the celery and carrots to add more flavor and improve the aroma during the braising process. Try it with calamansi. Allan – I think I’m one of those people who doesn’t like the skin in oxtial. I admit I don’t like the feel of it. :) I bought with the skin already removed. I’m supposed to use glutinous rice but opted for jasmine rice. It’s harder to control the consistency of the sauce when glutinous rice is used. Sometimes I feel it’s not absolutely necessary to use the rice at all because the peanuts have its own thickening ability. Thanks for your input. Thanks for the additional comments everyone. I think I chose a challenging dish and I believe Filipino chef and experts have a lot to say about this. Good thing I didn’t choose the simpler Beefsteak Tagalog although that is also good too. But Kare Kare is more open for discussion. @ Penny – thanks a lot. @ Mom-Friday – this is a great Asian site. There’s a lot of recipes you will love here. @ issaline – you’re right about that. I think it’s changing right now but still a bit challenging. @ Ebon – Thanks for your comment. My brother loved it with calamansi. Just a touch is good. Let me know what you think. @ Joyce – well said. Filipino food is melting pot of different cuisines. @ Lexa – a lot of people still don’t like Kare Kare even for some Filipinos. I felt that Kare Kare is a dish that although it is good, it will never be great no matter what you do. Just my opinion. That’s why some people don’t like it. The calamansi does sound odd because it is not traditional. But in Pampanga, kare-kare is eaten with green mangoes and bagoong. In that sense a sour fruit, citrus or not, seem perfect with the dish. The sourness counteracts the blandness of the peanut sauce. Those who say they don’t like kare-kare should try it with the calamansi or green mango. One of the best I’ve tasted. The calamansi adds to its distinct yet flavorful taste to the kare kare. To those who are having second thoughts about adding calamansi to the dish, I would suggest that you give it a try. You won’t regret it. Bee! Thanks once again for featuring a Filipino dish here! I get so excited when I see a new Filipino post :) And kare kare is definitely a favorite (as is Divina’s site!)! Is there any alternative to using peanuts? My girlfriend has an allergy to them. Thanks. @Mikecondo, Makati.. Hi, so sorry for the late reply. I haven’t checked on this for a long time. I’ve never done Kare-kare with other nut ingredients aside from peanuts. If she is not allergic to cashew nuts (unsalted) then you can try that… There’s also soy nut butter sold at the supermarket… You may want to give it a try. The taste might be different though.. Just let me know how it goes. Again, my apologies. You need another oxtail recipe ASAP. I am living in Tahiti right now and some of my friends who are French nationals asked me to prepare a Filipino dish for them to try. Thanks Divina for such a nice post of Kare Kare. You’ve got me! I have known this dish as complicated to do but you’ve shed light by sharing the 3 basic components. And thanks Bee for inviting her to write in your blog. I have the book of Marvin of Burnt Lumpia. I practiced his recipes at home and when mastered I cook for my karinderya each time I am in Manila. I live in Downsview Ontario Canada and have many Filipino neighbors and friends. When I get home after work the enticing aromas of adobos garlic-rice fill the hallway … Filipino food is very popular here in Canada … along with Korean, Sri Lankan and other exquisite intricately prepared food. I am fortunate!